If you have recently embarked on the wheatgrass juice journey you sure will find its taste intense and not very palatable, to say it gently. I first found its taste very grassy, raw and overwhelming. But knowing its benefits can really help you to get over the taste factor sooner and motivate you to have that morning shot daily. Avoid store bought and packaged wheatgrass juice as it might contain a lot of preservatives and additives that are not beneficial for your health. Try to drink fresh homemade juice for high nutritional value and better affordability resulting in improved health. Here's how to grow your own wheat grass indoors and outdoors. Wheatgrass juicers available in the market today can be used to exclusively juice wheatgrass, leafy greens and soft fruits. They are available for the price as low as $30. The reason why these juicers have gained so much popularity is because rather than chopping the produce at high speed to produce juice these juicers masticate it for better yield, nutritional content and freshness. Masticating, as the name suggests, chews the wheatgrass with a slow moving auger and press it against the wall of the juicier. This action ensures that more nutrients that are hidden behind the food wall are released. Slow rotation does not allow the juice to heat up that might kill the nutrients and also result in oxidation. The other benefits of masticating juicer is that it is economical in the long run as its produces higher quantity of juice in the process. It is also much quieter and durable than your traditional centrifugal machine. Let’s take a look at what makes the wheatgrass juice so remarkable. An ounce of wheatgrass contains approximately 120 calories, 240% of the RDA of vitamin A, 93% of the RDA of vitamin C, 356% of the RDA of iron, and 12% of the RDA of calcium as well as 8 gms of protein and 8 gms of dietary fiber. Wheatgrass contains chock full of vitamins, minerals, amino acids, liver enzymes, and chlorophyll. It is nutritionally a complete food and contains 98 of 102 elements found in soil, including phosphorus, calcium, iron, magnesium, and potassium along with essential enzymes and 19 amino acids. Chlorophyll, a phytochemical responsible for the dark green color of the grass, is essentially what makes wheatgrass so amazing. Wheatgrass contains 70% chlorophyll, making it a concentrated carrier of the sunshine or the first product of light. This nutritional profile makes wheatgrass a natural supplement to reap benefits for your skin, hair, and body and treat many conditions and promote overall health. Abundance of chlorophyll in wheatgrass helps improve hemoglobin production. Increased production results in increased oxygen carried by the blood and improves formation of RBC and WBC thus improving immunity. Wheatgrass is a natural detoxifier and helps treat various skin conditionals and diseases like psoriasis and eczema. Its anti-bacterial effectively helps treat acne and sun-burn and promotes healthy skin. Another benefit of high chlorophyll content is that is helps reduce blood sugar related problems like diabetes. The amino acid chain in wheatgrass helps stimulate metabolism and aids in weight management. It can also helps reduce hunger pangs and help flush out toxins, further assisting in reaching your weight loss goals faster. It can also help stimulate the thyroid gland. Wheatgrass is best known for its revitalizing effect on the liver. The high alkalinity and chlorophyll content helps in detoxification of liver and blood by removing toxins and reduces the risk of cancer. It is very helpful in improving digestion and improving the condition of individuals suffering from digestive disorders like heartburn, ulcers, indigestion and irritable bowel. It helps stabilize lipid levels and thus is great for reducing cholesterol by blocking its absorption. The high chlorophyll concentration is believed to help treat arthritis and reduce joint pain due to its anti-inflammatory properties. Effective in reducing the blood pressure and enhancing the capillaries. Wheatgrass works as a body deodorizer. Regular consumption of the juice can help reduce the odor naturally by removing the toxins. Wheatgrass is also known to improve dental health. Gargling with the juice can help prevent tooth decay by removing harmful toxins. Its antibacterial and anti-aging effects help improve skin health and fight aging. It helps in skin rejuvenation, fight skin sagging and maintains skin elasticity. It is also helpful in fighting common cold and other respiratory tract problems like bronchitis and fever. 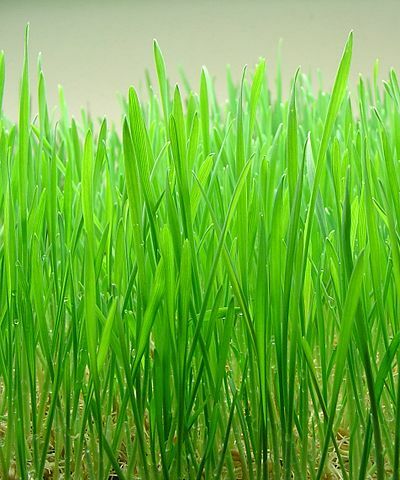 Wheatgrass is also beneficial in treating hair problems like dandruff and scalp problems. It is also helpful in reducing grey hair. If you are looking to treat certain health problem, then you should drink 1-2 oz. up to 3-4 times a day. Start slowly with an ounce a day and slowly work your way upto your 2 ounces a day if you aim to promote health and improve skin and hair. Remember that wheatgrass juice is a cleanser and not a food. Hence it should not be consumed everyday for extended period of times so that it does not lose its effectiveness and avert aversion. The best time to ingest wheatgrass is in the morning, on an empty stomach. You can mix wheatgrass juice with other fruit and vegetables to make it more appetizing. 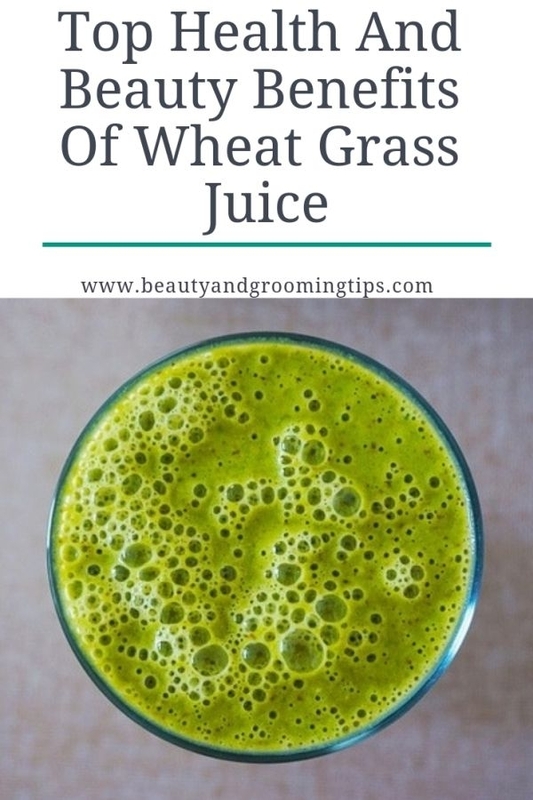 People who drink wheat grass juice benefit from a number of vitamins and minerals. I works i am using this grass juice regularly.